This is just bigger than Ben Hur.. 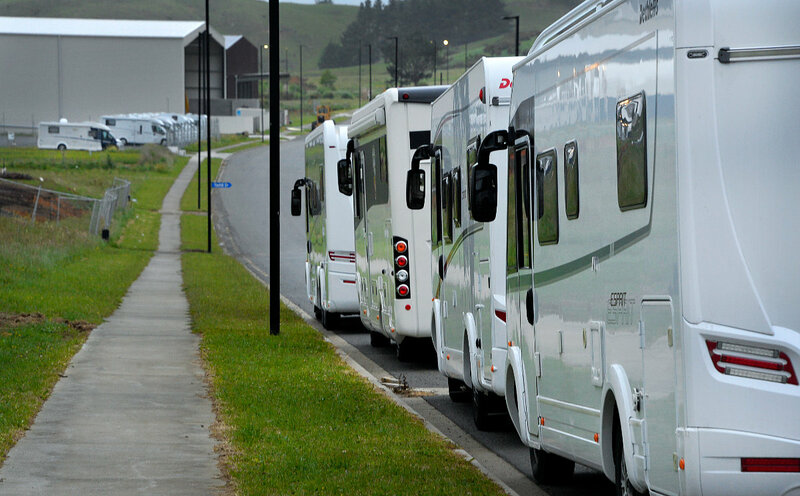 There must be more than 450 Motorhomes and Caravans here and they’re still piling in. Looks impressive from the entrance.. click on this to enlarge it. Due to the weather being rather nasty last weekend, the Barfoot and Thompson Races were postponed to coincide with this rally and the races were on while the Motorhomers were crossing the track into the centre. … Between the races of course. All in good humour and as the day went on, little groups popped up all around the rally with gatherings for a few quiet cold ones while the horses galloped around the track. A great atmosphere. It never ceases to amaze me how the good folk of the NZMCA who put themselves out there and go the extra mile for the benefit of everyone else. The Covi/Spoton team organised this rally from scratch and had a roster to make sure that everybody that needed some help or guidance got what they needed and were happily and safely parked. It was disappointing to hear that a few NZMCA members who failed to check whether their dogs were allowed, made a scene and got unnecessarily nasty for our cheerful volunteers. Come on guys.. Common sense… Racecourse, horses and dogs don’t go together.. especially when there is a race meeting on. For those responsible for this display of bad manners, it’s nice to think that we could be be respectful and helpful for those volunteering and doing their best for the rest of us. On the positive side, one of the volunteer Rally Marshalls, Jim was telling me that a couple of members who arrived with dogs just to see where they could go, were very thankful when they were redirected to another parking spot just around the corner where dogs were permitted… Nice ! The team also organised a great free bus service to the show which was fantastic. A great rally, some nice people and thanks to Auckland Racing Club, Ellerslie racecourse and of course the Counties NZMCA team for having us there. Covi show story next up. 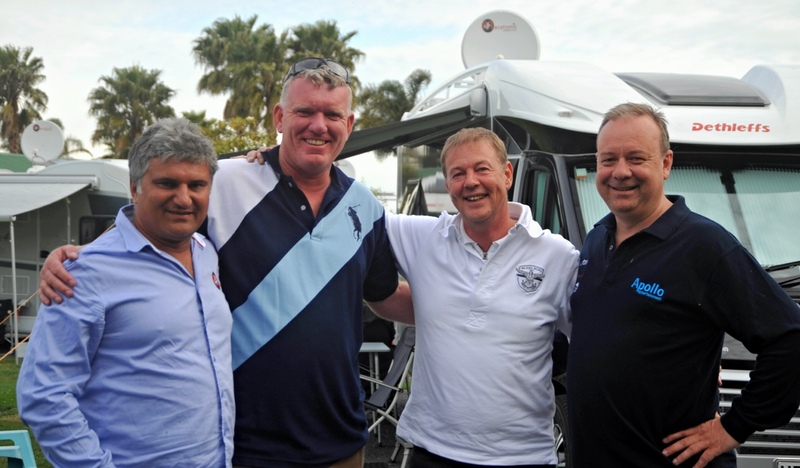 It is always a great occasion once a year when the nations Dethleffs owners get together for a catchup all in one spot. 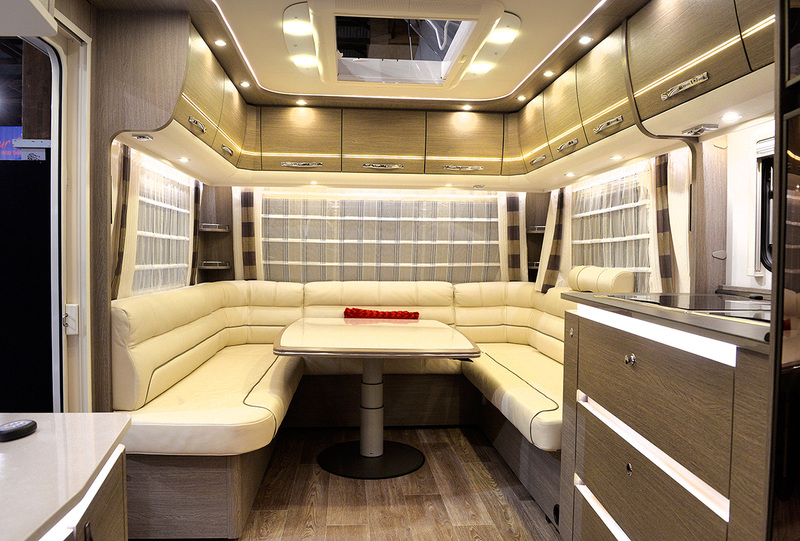 Its a good opportunity to see what others have done to their vans to make their motorhoming more fun. 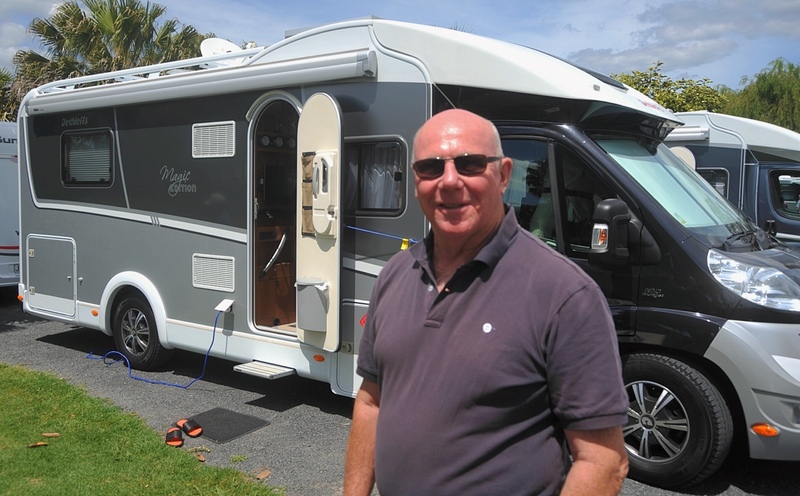 This year was the biggest yet with 75 motorhomes and caravans which made life interesting to yours truly and my old friend Gary from Taupo to get them all parked. We had a lot of fun as we did it with little walkie talkies that Gary had. The hard part was not being able to have a chat with everyone as they came in, that had to wait for later. 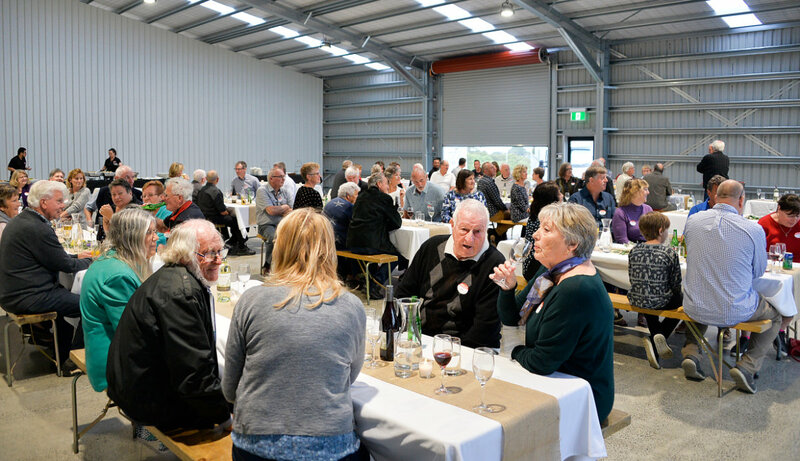 As they all had the same sided habitation door, we decided we’d park them in rows with the doors facing together on a 3 metre space and the opposite side being a 4 meter space so that people could escape without skittling tables and chairs etc and it worked really well. From the road .. impressive. 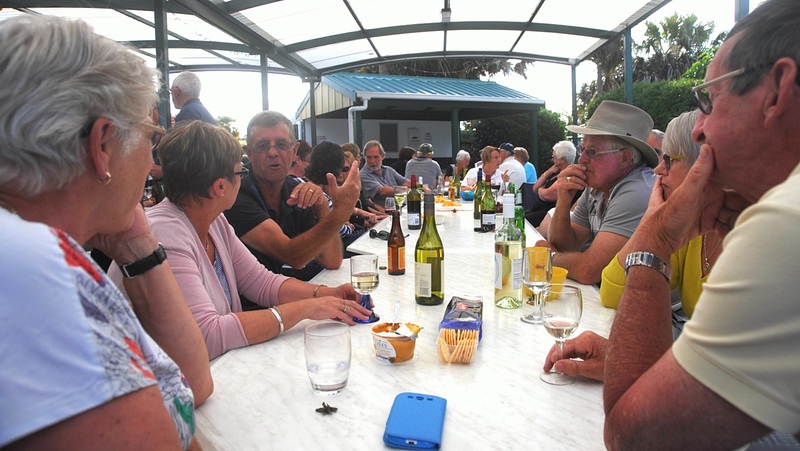 The first 40 odd arrived on the Friday and everyone settled in, met old friends and checked out the car museum. The car museum is fabulous. 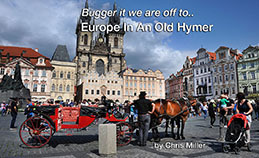 We visited this last March and had a good look through. You can see that here. There are all those cars that we had as kids, the Mark 1 Zephyrs, the Prefects and a lot older. It really is something to see. Outside is normally a NZMCA POP where you can stay overnight and it was nice to see friends Marama and Karen pop in for the night. The next day after a good breakfast in the Juke Box Diner onsite, we caught a bus to a local Tea Estate and got to taste and learn about locally grown tea which was really interesting and on the way back popped in for lunch at the Hamilton Gardens Café. Some decided to walk off their lunch around the amazing gardens. Peter and Bernie on their tables! After getting back to HQ at the museum, it was open home for motorhomes so a quick vacuum and a tidy up of Rafe and it was visits all around. Lots of fun and it was nice to see people we hadn’t seen for a long time. 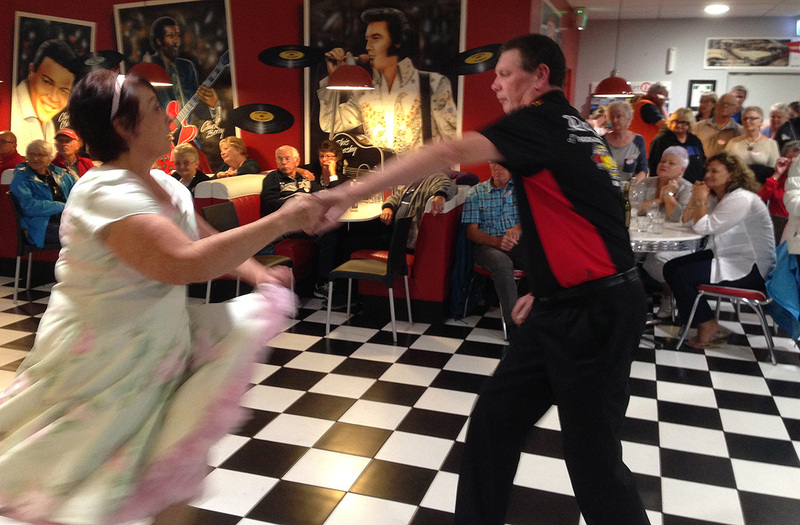 At 6pm it was time for a drink in the Marquee and a feed in the Diner which was immediately followed by a great display of the local rock n roll dance club and they were fantastic. Slightly blurry cell phone pic! We finished up the day with Dianne and Gary with friends Ian and Lynda in their XLI right next to us. A lot of fun and we had some great laughs. Ian and Lynda’s XLI on the left, Rafe on the right. A great day and well hosted by Mr and Mrs Dethleff in NZ, Jonas and Irene Ng. Thanks guys and thanks to Dianne for organising a great day out. And the Netspeed speed test from this site. 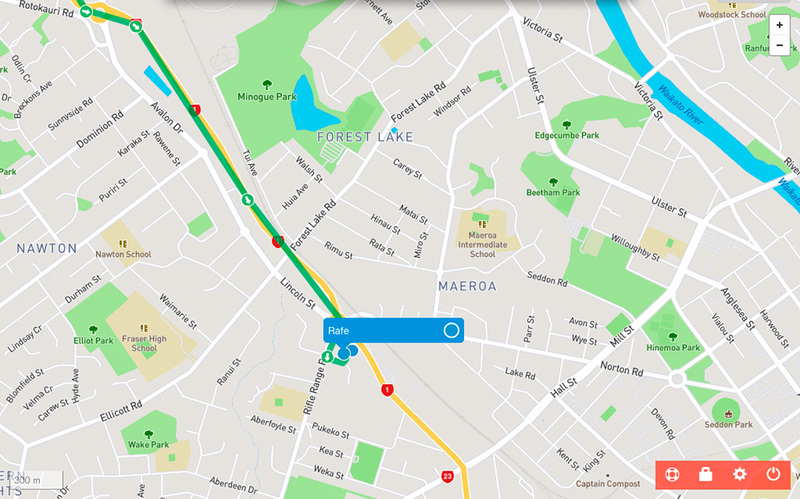 While we were at Kuratau, we went for a trot through the park at the back of where the rally was and followed the river down to the Taupo lakefront. 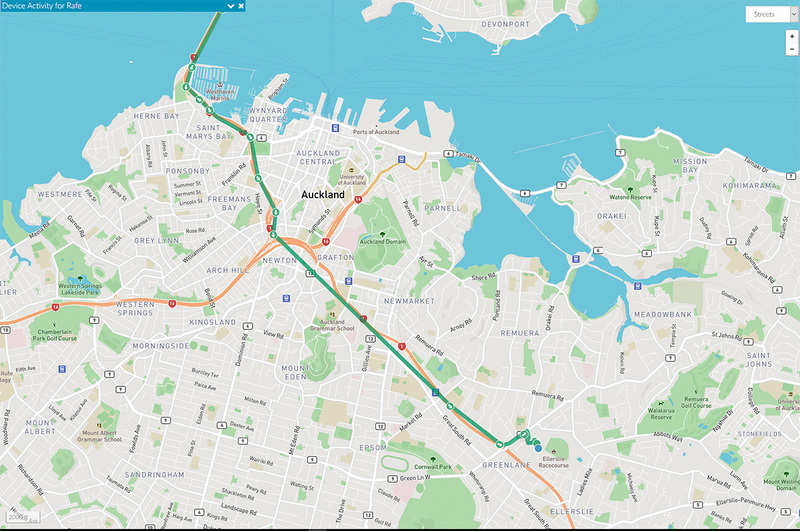 There are well set tracks and it is an interesting walk through bush and parks. A real contrast of landscape. 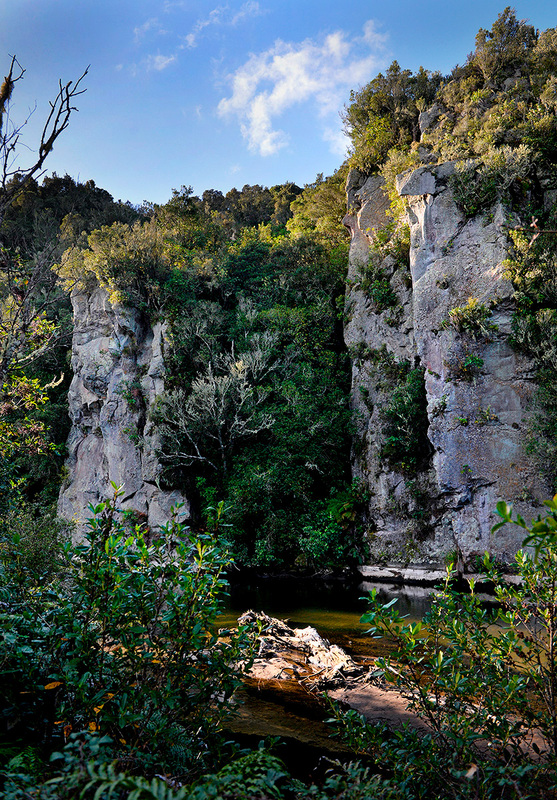 Huge cliffs up from the water and really colourful trees and river reeds. There are some houses lucky enough to have a jetty at the bottom of the lawn against the river too. At the lake front, there is an interesting walk down to a memorial on the lakefront. Some children were happily playing in the water, the sun was shining with no wind. Another nice part of the world. 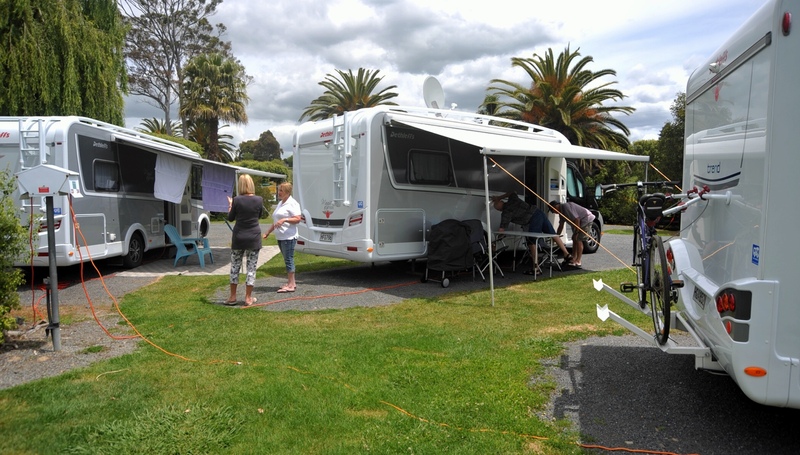 A great turn out from Motorhomers saw the car parks chocker on Thursday. Friday arrivals were redirected to Ellerslie racecourse to the centre of the track. There was a free shuttle going to and fro from the show to the carpark which worked really well. Ellerslie was free and we got a free bag of lollies for the inconvenience, what inconvenience? 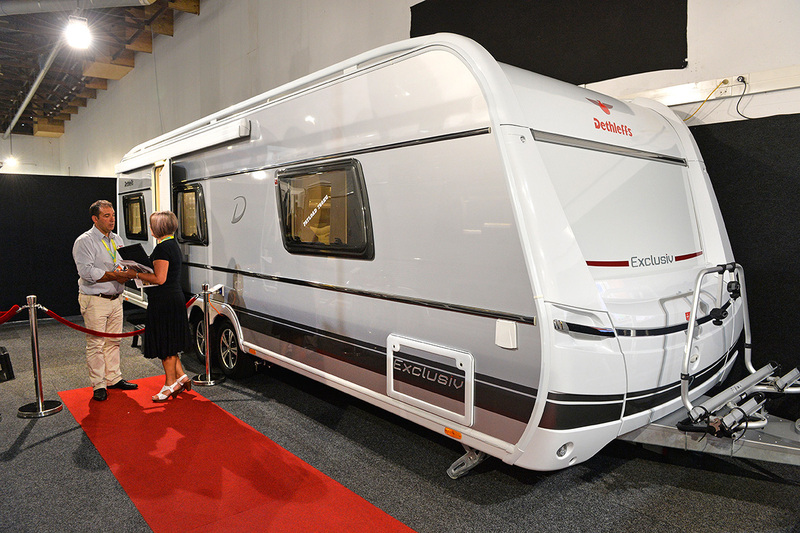 The show seemed a bit smaller this year, maybe I missed a bit but the big difference I noticed this year was the trend towards caravans. Dethleffs Esprit. I’m not sure what Bernie (in the blue) said but the punters look a bit stunned 🙂 It would have been something good knowing Bernie ! It was really nice to see the Lilliputs there with their classic cars. 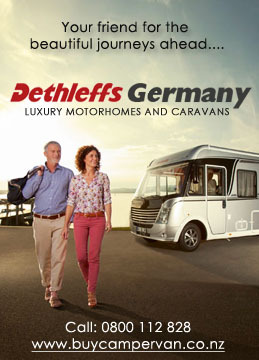 The Dethleffs caravans were impressive. Lots of space and nicely decked out. The title pic is the interior.. nice ! The pictures really tell the story. I ended up back at Ellerslie mid afternoon and prepared myself for meeting people as you do! 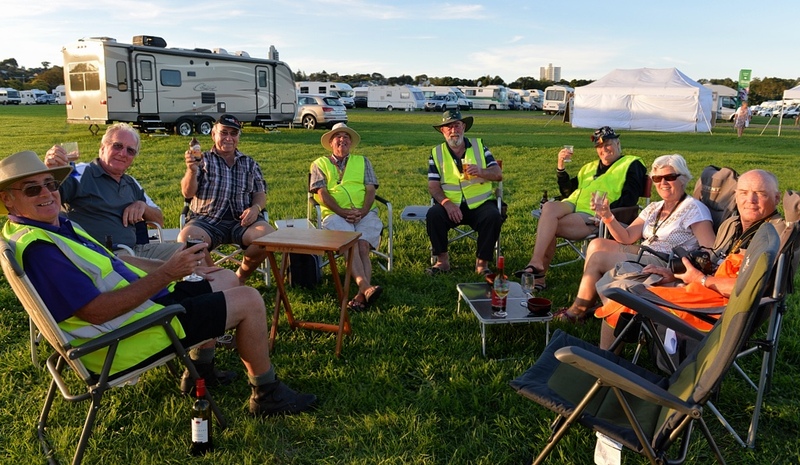 It was nice to catch up with some Dethleffs owners later in the day amongst all the other people, Motorhomes and Caravans. 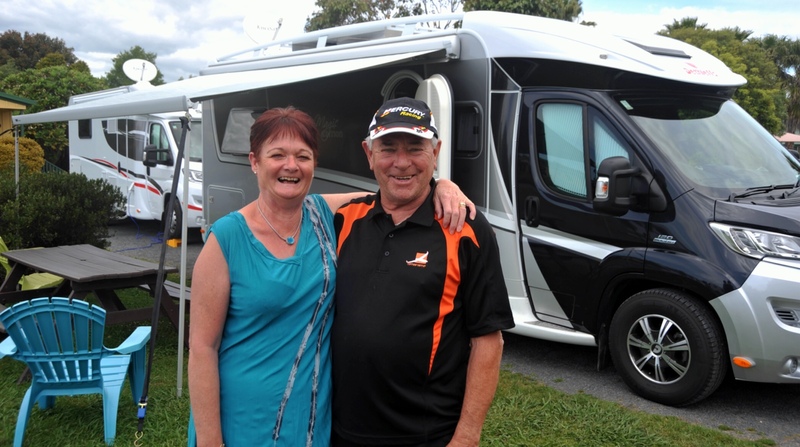 This was Pete’s first rally with his new Dethleffs Black Magic so it was great to see the Kiwi ingenuity being applied to his van. 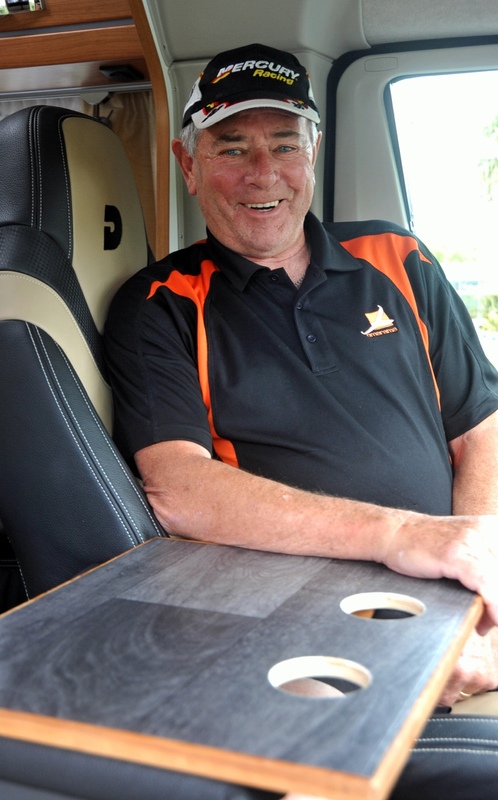 There is a notable absence of anywhere in the Ducato cab for holding coffee. Pete decided this had to change and came up with a nice tray with locking blocks underneath the hold it between the two front seats on the seat arms. Clever use of dead space and with the use of matching vinyl from the floor and a nice wooden surround, it really looks the part. This is Richards second year at a Dethleffs owners rally so it was nice to catch up again. 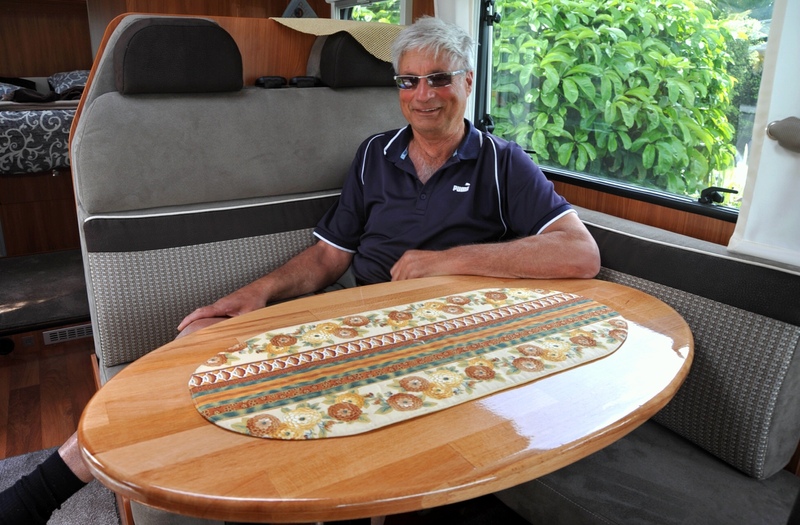 Being the clever chap that he is, he significantly upgraded his dining area with a new table. Looking at the photo again, it looks like it might be Kauri. Very Nicely done! 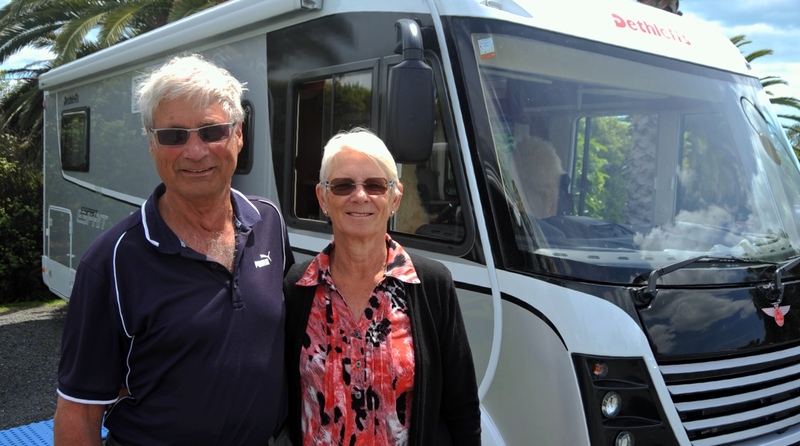 The nice thing about a get together like the Dethleffs Owners meetings is to catch up with other owners like John with his Dethleffs Black Magic, and see the modifications and improvements they have made to their Motorhomes. One of the wee gems that I really liked was John’s change to his curved galley cupboard which was hinged with shelves, into a full slide out cupboard. 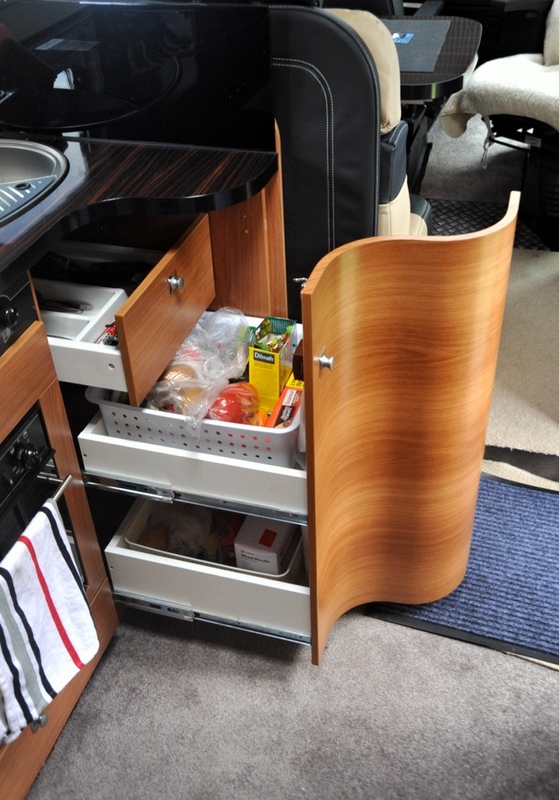 It completely changes the the availability of the shelves behind and allows you to make better use of the shelf space. 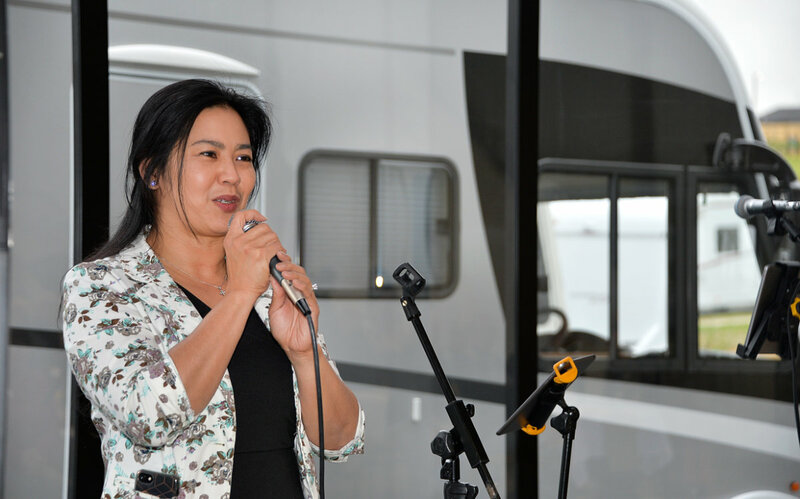 After a great day of meeting new people, swapping notes and checking out new Motorhomes, everyone arrived at the Miranda Motorcamp outdoor kitchen. While most continued the chat over a cold orange juice, a BBQ fry up was under way by Owen and his team representing Jonas and Dethleffs NZ. 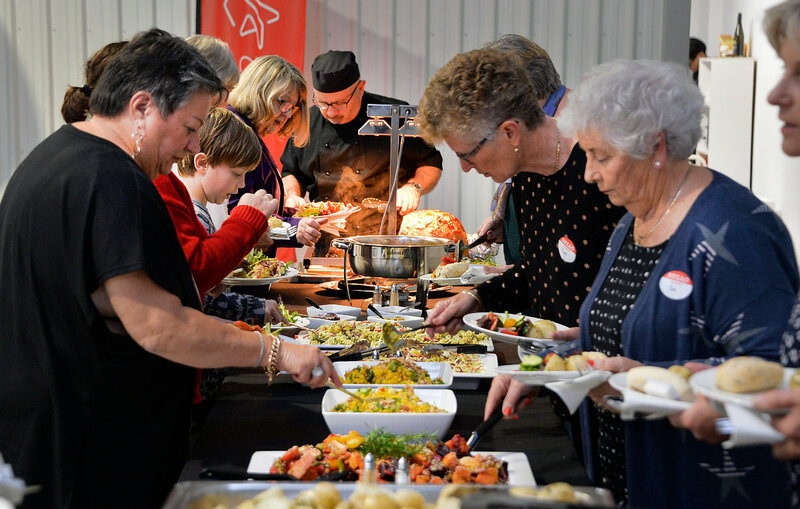 They did a magnificent job of cooking for over 80 people. Thank you Owen, Jonas and Dethleffs NZ for providing the great food and for another great event. 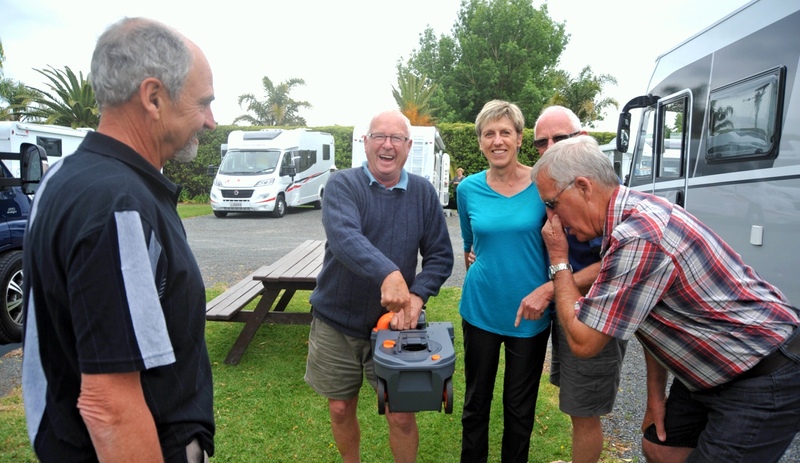 A surprise for the evening was the presence of a team from Mecatronics and Kiwisat in Italy who supply the bulk of the Dethleffs TV antennas in NZ. The team from Mecatronics with Rob from UCC in Christchurch (with the blue stripe) and the agent in NZ for Mecatronics on the right. 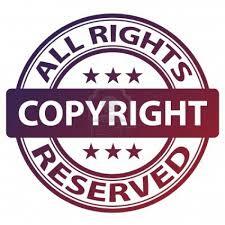 Enjoy the Gallery and remember to select the images for hi-res images. Happy people enjoying a cuppa in company this morning. Dethleffs crews in the outdoor Kitchen area. 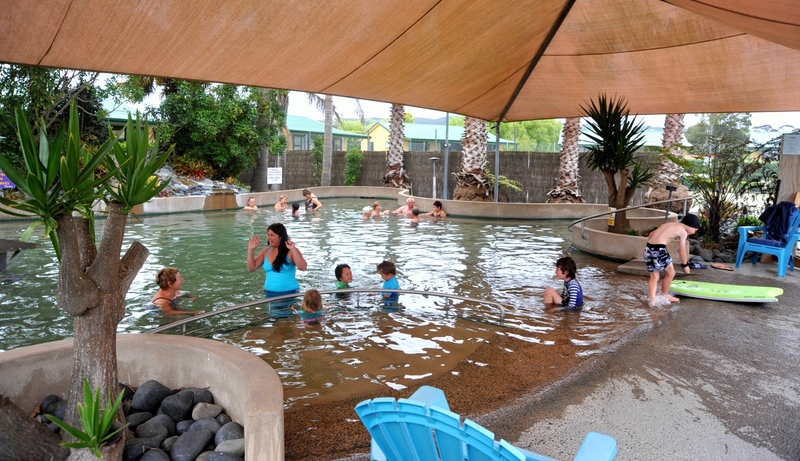 After the tidy up, many retired to the hot pool in the Campground. Bernie had an impromptu class of how to look after and maintain your toilet cassettes. The reaction from the willing students was priceless! Dethleffs owners and others enjoying the Hot pool this morning. This morning, many left to head home to all over NZ but there are quite a few staying on. More tomorrow! 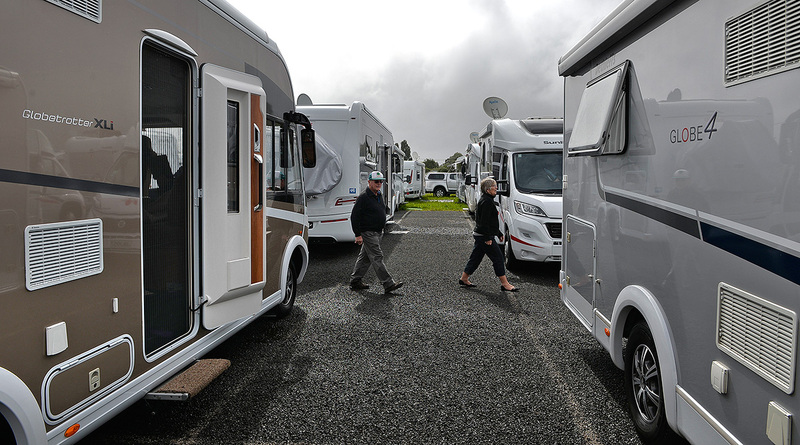 A great showing of hardware, nice weather, lots of happy faces and gatherings of like minded people swapping notes and enjoying their Motorhomes. 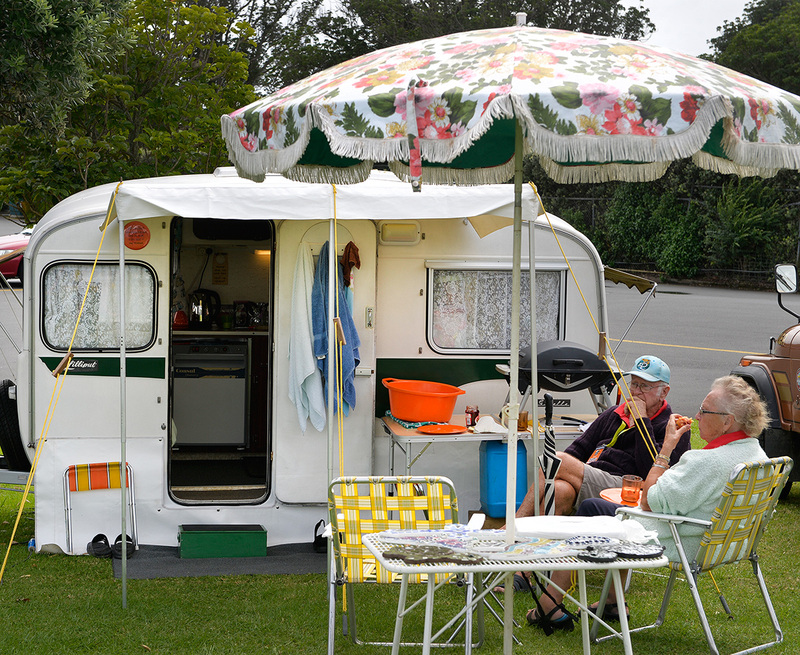 Miranda Holiday Park is a great venue and is chocker with Dethleffs. I’m looking forward to a swim in the hot pools later. 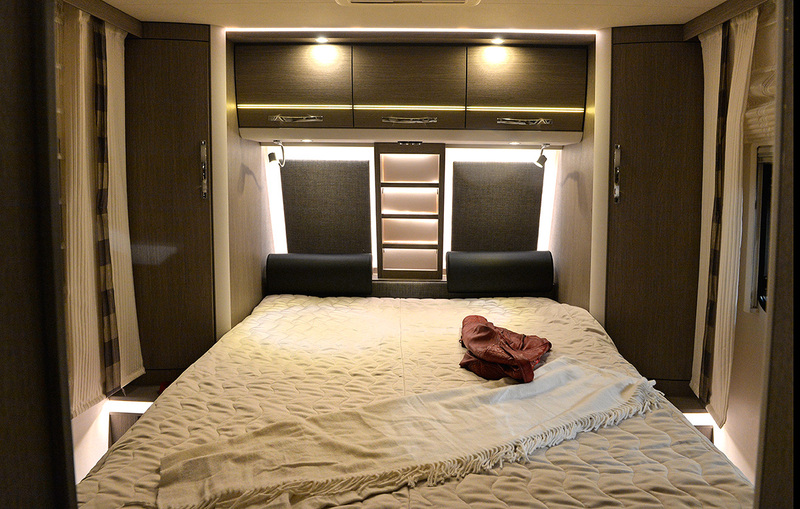 It I s interesting to see innovative improvements made by owners to their Motorhomes. I’ll post more on these over the next few days. 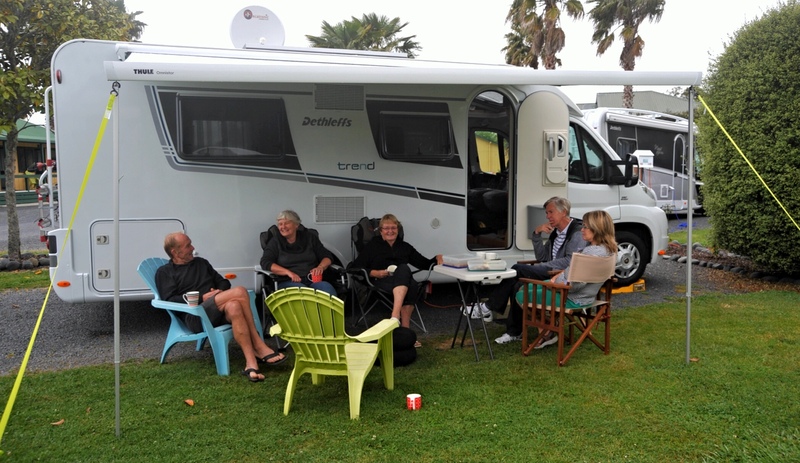 Last year, we had 24 odd Motorhomes attending, this year it is more than 40! What will it be next year.